In the movie WALL•E the Buy n Large company intiates the five year plan "Operation Clean-Up" to clean Earth and make it habitable again. Eventually the plan is deemed a failure and directive A113 is issued, declaring Earth a lost cause and setting the stage for the approximate 700 year time lapse. During this time the Waste Allocation Load Lifter • Earth Class robots continue to do their job, that is, they continue to compress the trash into cubes and stack it in nice neat piles. 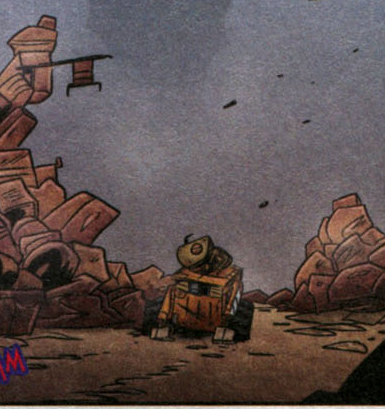 By the time of the movie, the WALL•E we get to know is the only (apparent) remaining WALL•E unit still in operation. My question is, why is this WALL•E unit the only one that is still operating? BnL technology was clearly built to last (many digital billboards and advertisements still work, automatic doors work etc) and there were lots of WALL•Es involved in Operation Clean-Up (we can see the "dead" remains of many of them in the opening sequences). Since they had the ability to scavenge their dead brethren then there should have been at least a couple more still in operation, considering the stockpile of parts that Wall•E had accumulated. The Wall•E we know is "faulty", the fault being personality, (like that of Johnny 5, short circuit). This being the case, instead of just compacting trash, he shows interest in other things; objects, his existence, and eventually his survival, causing him to scavenge parts to keep him self going, to feed his curiosity for the solitary world he inhabits. To answer another question someone asked, why EVE probes are still being sent out after A113 initiative to cancel operation recolanise. This A113 initiative is classified beyond the captains security clearance and was sent to the autopilot, therefore the probes must still show to be actively seeking life on earth. Can you imagine if people on the ship knew earth was completely abandoned? Source: My son has watched the film and extras almost everyday over the past year, causing my brain to absorb useless movie trivia. Luck. Some unit had to be last. Wall-E's peculiar personality traits lead to a more efficient self-care and repair regime. Or possibly the cockroach helped. I prefer the latter idea. In the official production notes and interviews, writer/director Andrew Stanton has consistently said that the essential concept behind the character of WALL•E is, "what if mankind had to leave Earth, and somebody forgot to turn off the last robot?" The Buy N Large corporation initially had a plan to return to Earth. Based on Stanton's concept, it is likely that when their cleanup plan failed they intentionally turned off all the WALL•E units, somehow missing only one. First off, as shown by WALL-E's behavior in the final scenes of the movie, most WALL-Es were not self-aware, and were relentlessly single-minded, managed by human teams as part of Operation Cleanup. The idea, laid out by Andrew Stanton in the commentary, was to set them loose over a wide area, and they'd divide and conquer, gathering up the trash and building the skyscrapers of garbage, which would then be consumed by the big conveyor-belt eating machines and incinerated. However, burning all of that trash had unintended consequences ("rising toxicity levels" as mentioned in the A113 message), and eventually the remaining humans who were managing Operation Cleanup couldn't survive the conditions, and had to leave in a hurry. The robots, it's implied, were never actually turned off; they were just abandoned to their fate by the humans, who assumed all the robots would eventually break down for lack of maintenance. The one WALL-E left, the title character, has somehow gained digital sentience (and a personality), through some programming abnormality, a fortunate accident, or simply the slow accumulation of knowledge over the 700 years he's been functional. 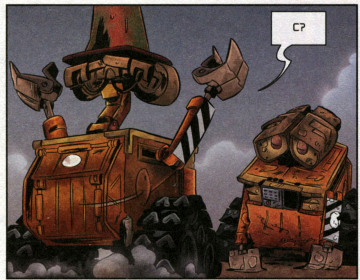 How and when it happened is unknown, but it's implied to make WALL-E unique. By becoming self-aware and able to learn, he has also gained the smarts to stay alive (thus furthering his primary directive) by learning to cannibalize the other WALL-Es as needed. 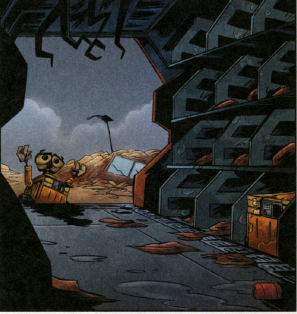 If we accept that WALL-E's sentience and ability to cannibalize is unique among his kind, which it is for all we can tell, then it follows naturally that WALL-E's the only one of his kind still functional, because all others, unable to adapt, would have succumbed to the worsening conditions on the planet over time. The opening scenes show that WALL-E has taken this trait one step further, collecting various things he's found interesting among the refuse. Andrew Stanton and his art team took pains to contrast WALL-E and EVE heavily in form and function. You pretty much understand at a glance how WALL-E works; tough, sturdy, no-frills utility bot, powered by electric motors, servos and hydraulics, and what was probably little more than a Roomba's programmed intelligence at first. EVE, as Stanton says, is the Porsche to WALL-E's Jeep; fast, powerful, built to survive alone for months or possibly years, programmed from the start with self-awareness and learning capability, and because she represents the cutting edge of human technology as of shortly after the starliners left, which itself is probably hundreds of years beyond our present time, we don't quite understand exactly how she works. However, until she's exposed over time to WALL-E's quirky digital personality, she's almost as single-minded about her directive as WALL-E originally would have been; while she shows some human emotions, like happiness, fun, and frustration, all before she's formally introduced to WALL-E, she has a job to do, and she knows it, placing her friendship with WALL-E second (sometimes last) in her list of priorities until much later in the movie. As far as Earth technology being built to last, not everything left behind is still working; in fact the majority of the tech left behind is non-functional. Most of what does still work does so by convenience for the story. The relatively advanced tech that we see still working is primarily in the opening scenes, as a way to tell the audience what's happened to the planet and its former inhabitants, and in the final scenes to allow the docking and unloading of the Axiom from a docking cradle that would have been immobile and idle for 700 years. Most other Earthbound technology that still functions does so to make a gag work, like the singing fish, the iPod and VCR, or the CRT TV and Pong game. There's plenty that isn't explicitly broken down for the audience, but for what it's worth I think WALL-E's universe is among the more well-designed and well-explained of sci-fi alternate realities, and it does so with precious few words. 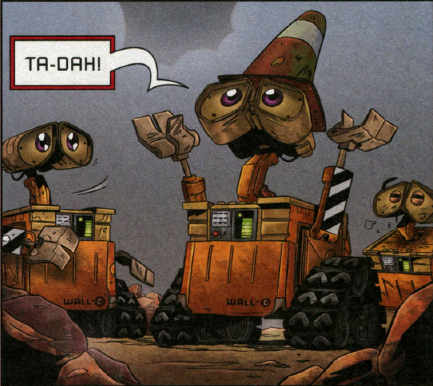 According to the officially licenced comic serial "WALL•E: Working to Dig you out", our hero was the last active WALL•E unit out of several dozen working from the loader we see in the film. The others suffered damage, injury or just plain ceased working after decades of activity. Our hero seems to have survived the past 700 by demonstrating a willingness to cannibalise his dead comrades for parts, a penchant for creative thinking in emergencies and a deep fear of the elements. It's notable that even when there were other WALL•E units around, he was still the class clown, suggesting that his personality defects weren't due to loneliness. How do you know there weren't some Wall-E's elsewhere? They would only have a small range (or at least confine themselves to an area) so would only be able to harvest other wall-E's for 'Spares & Repairs' for a short while. It's conceivable that more Wall-E will be found, although something tells me that Wall-E's were made long before the billboards and automatic doors and the spaceship were crafted, and just left without much hope of success. What I think is that the other Wall•Es have suffered serious damage. Like, for example, remember that garbage mixed up with sandstorm? Maybe that's what killed most of the Wall•Es, and maybe 1 Wall•E (which is the one who likes Eve) survived because he was SMART. It is conceivable that the storms had a role to play in the other unit's demise. Referencing back to some other points made on here regarding the difference in technology between the buy'n'large signs etc and the clean-up units, the premise to the plot (to me) is consistently objectifying the wasteful nature and greed of humans. Take this into account with the systems designed to sell products and this ties in nicely with lazy vastly over-engineered designs (which again reference a culture of wasting resources). This would clash with the systems designed to clean up waste. The Wall-E robots are clunky, almost hurriedly designed with a specific purpose. These units may not have been intended to last long with the 5 year plan and with the core back-story being the excessive build up of waste, it is clear that waste management was clearly not the human's strongest ability (again referencing to greed and excessive un-restricted consumption). With this in mind, the robots may have been under-designed on a minimal budget and the dust storms being a problem that had not been incorporated into the original specification. So, why was Wall-E the last one left... This could be a mash up of all the reasons given by other writers, glitches in the system, an oddity in the programming or perhaps our Wall-E was the only one to be in the back of a van at the time a storm hit and thus it saved him. yeah, but in the beginning, when he's switching tracks with a deactivated WALL.E, a lot of them are buried, stuck, or have fallen with a large garbage tower, thus killing off that lot. Though, probably incredibly long ago. Not the answer you're looking for? Browse other questions tagged wall-e or ask your own question. Why do the robots on the Axiom keep the humans alive? How Did the Space Junk Stay in Orbit in Wall-E?